The KDE Promo team works on spreading the good word about the KDE Community, its software, projects, and events. We do that by attending conferences and trade fairs, where we give talks about the latest KDE technologies, show our software to visitors in live demos, and give out some sweet KDE swag. We also write news articles, release announcements, social media updates, and help with producing visuals, videos, and written content for community websites. We are in the process of updating the Promo team pages on this wiki to make things easier to find. It's possible that you will see some broken links or outdated content. If that happens, please let us know so we can fix it. To understand better what we do, take a look at Promo's Long Term Goals. 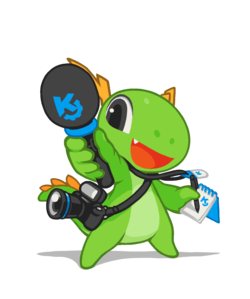 Following KDE on social media – This is the easiest way to contribute to KDE Promo. Just follow our social media accounts and start sharing the content we post! You can help us reach a new and wider audience by translating our posts into different languages spoken in your community. Of course, you can also craft your own posts about our software and community. Proposing your own idea – See an opportunity to spread KDE that we haven't thought of? Want to get help with making it happen? Let us know by contacting us. We can provide feedback and potentially help you out along the way. Representing KDE at an event – We are always in need of people to represent KDE at conferences, local meetings, etc. All you need is a passion for using KDE and the right materials. You provide the passion, we'll provide the rest! Check out this section to download all the material you'll need to give a lecture or host a booth at an event. Last but not least, find more tasks and things you can do as a new Promo team member! There are usually many things going on within the Promo team. We use this wiki to store relevant information that can be shared with other community members. Here is a selection of some useful resources that Promo team members commonly refer to. You can also see the overview of all wiki pages in the Promo category. This page was last modified on 25 January 2019, at 21:04. Content is available under Creative Commons License SA 4.0 unless otherwise noted.